On 17 July 1585, the people of Ashbourne in Derbyshire were granted a charter by Queen Elizabeth I for the founding of a Free Grammar School. The Queen, via Sir Francis Walsingham, had been petitioned two years earlier for the founding of a school, noting that ‘for wante of scholes the youthe of that cuntrye followe the olde traditions of men and rather cleave to Papistrye than to the truthe of the gospelle’ and were ‘given over to wickedness and vyces such as swearing, Drunckedness, whordome, idleness and such lyke’. 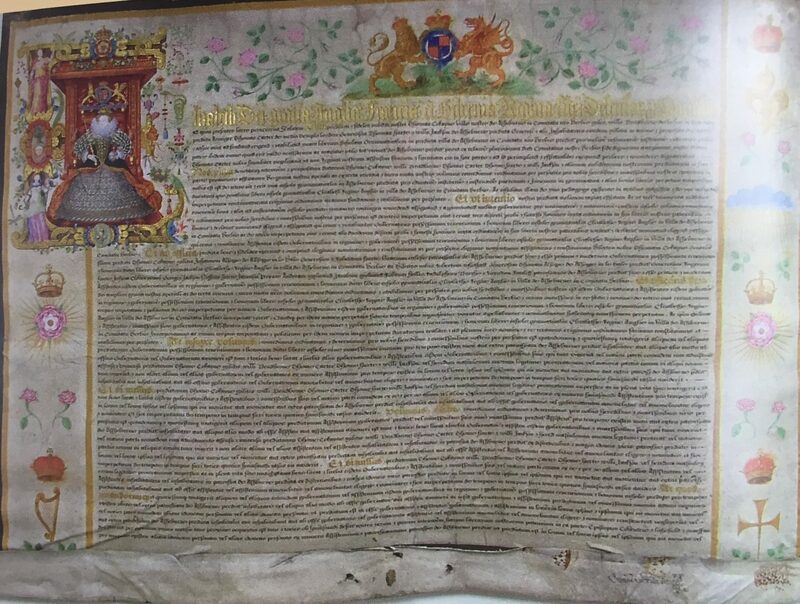 Over the summer of 2017, Ashbourne has been displaying the three large folios of the charter (usually stored at the Derbyshire Record Office) and its original seal (usually at the British Museum). I’ve been to see it, and it’s a beautiful, illuminated manuscript. It also has some unexpected and exciting information in its iconography. 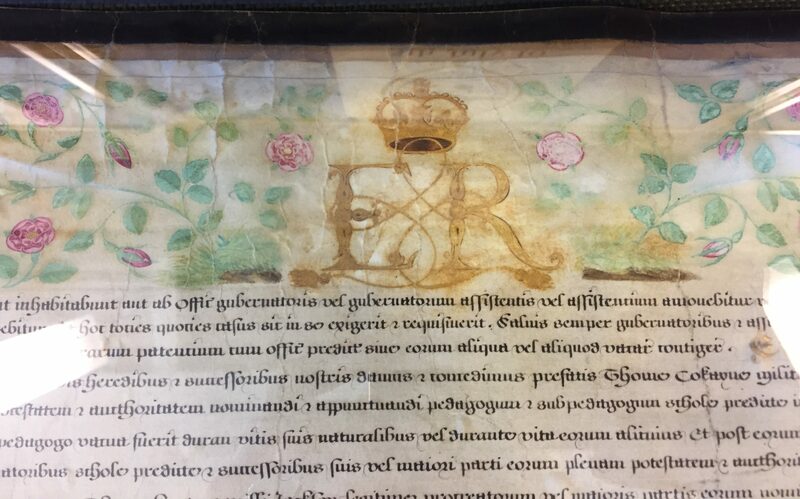 The initial E for Elizabeth is gorgeously decorated. It is almost identical to a charter granting the foundation of Emanuel College, Cambridge, from 1584, which is known to have been the work of the artist Nicholas Hilliard. Ashbourne’s may therefore be by Hilliard or is, at least, after him. Elizabeth sits on a throne, under a canopy of estate, holding the orb and sceptre. Above her is the royal coat of arms (the Lion of England and Dragon of Wales) and, above that, the Tudor rose, crowned. Around her are figures representing Justice and Wisdom, and around the initial are flowers, a robin (a symbol of Robert Dudley? ), a snake, eglantine, and other decorative elements in the style of the Renaissance panels at Nonsuch Palace, her dress in the portrait of Elizabeth I at Hardwick Hall (also from the workshop of Nicholas Hilliard), or the decorative border of the Hampden portrait of Elizabeth I by Steven Van der Meulen. 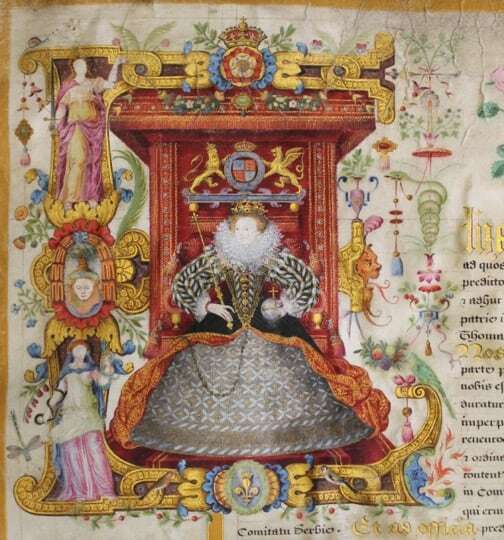 This is all gorgeous and lovely, but what has especially excited me is on the third folio: here the central badge is not derived from her royal line through her father, but is the badge of her mother, Anne Boleyn: a Falcon Argent (silver), crowned (with the Imperial Crown), holding a sceptre Or (golden), on a tree-stump (or ‘woodstock’). Why is this exciting? Well, people often ask how Elizabeth I remembered her mother, Anne Boleyn, and the extent to which she honoured her memory. We have some scraps of evidence. In The Family of Henry VIII portrait from 1545, the Lady (Princess) Elizabeth appears to be wearing a pendant A, as if in memory of her mother. And there are two instances that I’ve found of Anne Boleyn’s badge possibly being used by her daughter. 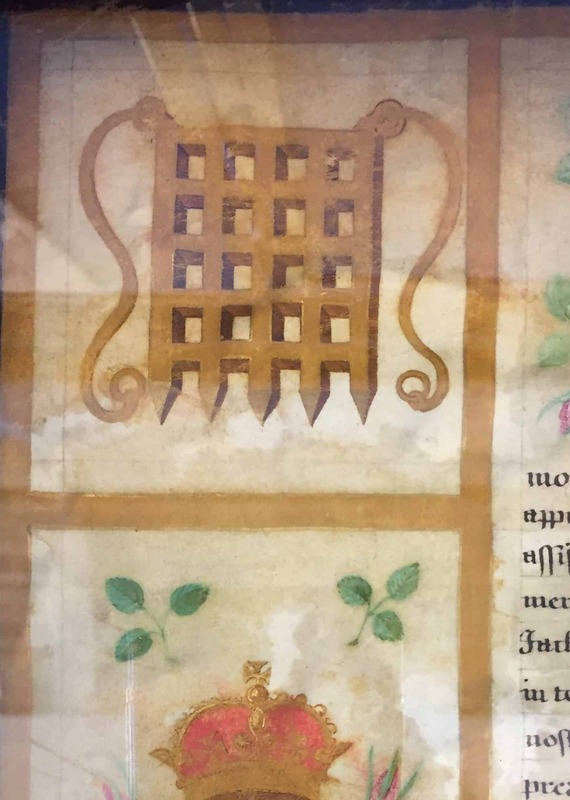 At the V&A, there are two items belonging to Elizabeth I that appear to show Anne Boleyn’s badge: a napkin and set of virginals (a early keyboard). 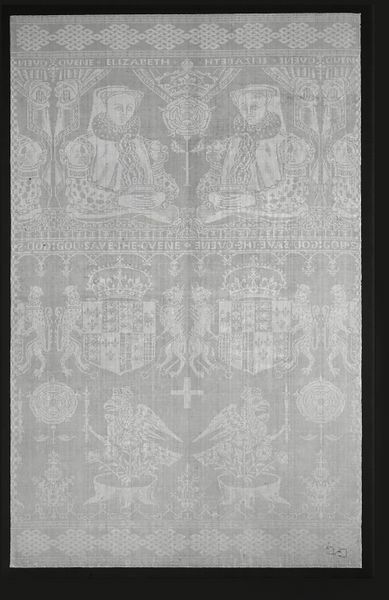 The napkin, of linen damask, is thought to have been woven in Flanders in the last thirty years of the sixteenth century, and features Anne Boleyn’s falcon. 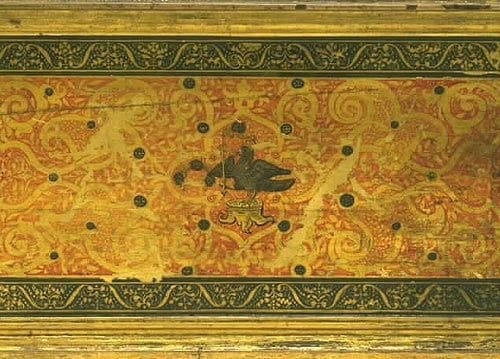 The virginals were decorated by the Venetian Giovanni Baffo, and during recent conservation, the date ‘1594’ was found on them, so they may date from this period – and in one panel, Anne Boleyn’s falcon can clearly be seen. 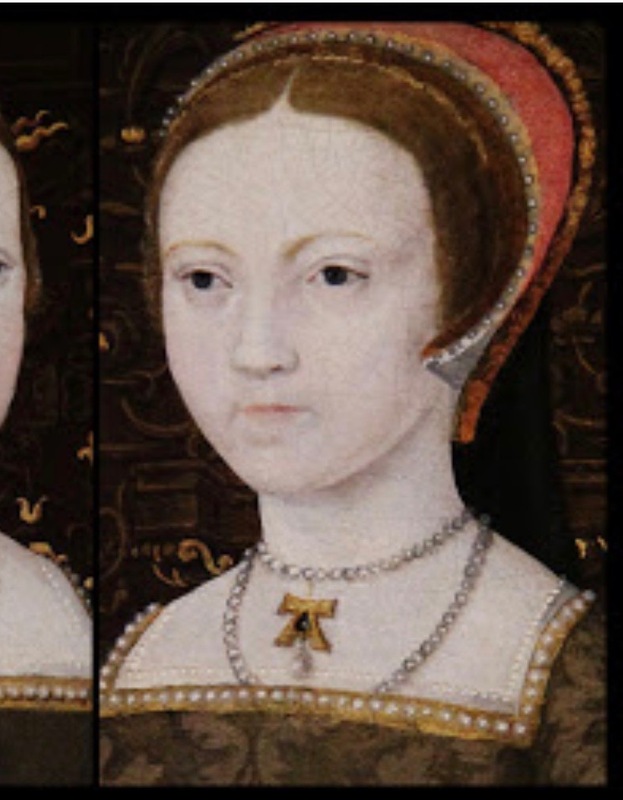 But Eric Ives, alternatively, believed that the virginals may have belonged to Anne Boleyn and have been inherited by Elizabeth. So, that’s not much to go on. 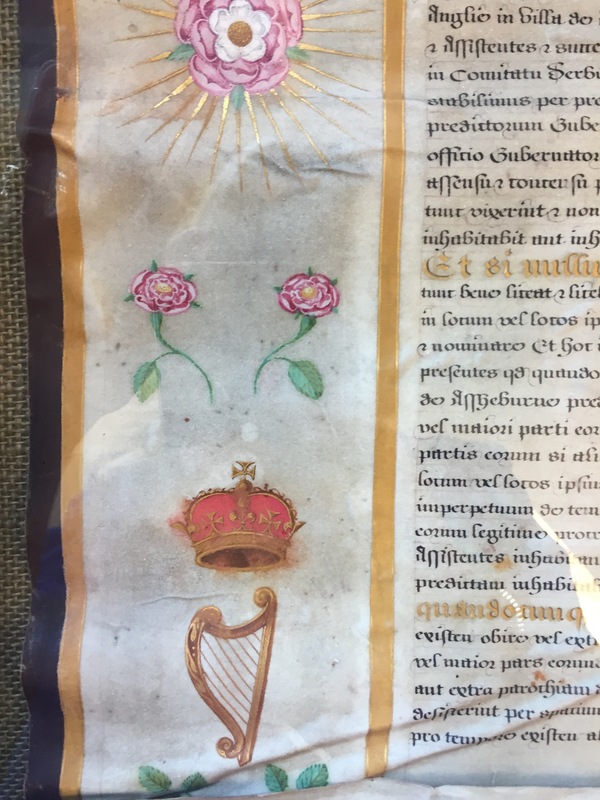 The fact, then, that this charter from 1585 – an official document issued by Queen Elizabeth I – features a large and colourfully illustrated image of Anne Boleyn’s badge seems to me highly significant. I think it is very unusual to find its use on a document of this order and suggests the rehabilitation of her mother’s memory. It gives us crucial evidence about the way Elizabeth honoured and remembered her mother. My next step is to investigate other charters issued around this time and to see if this is, indeed, unusual, or rather, a common feature of such Elizabethan manuscripts. If anyone has any further information, I’d be most grateful to hear from you. 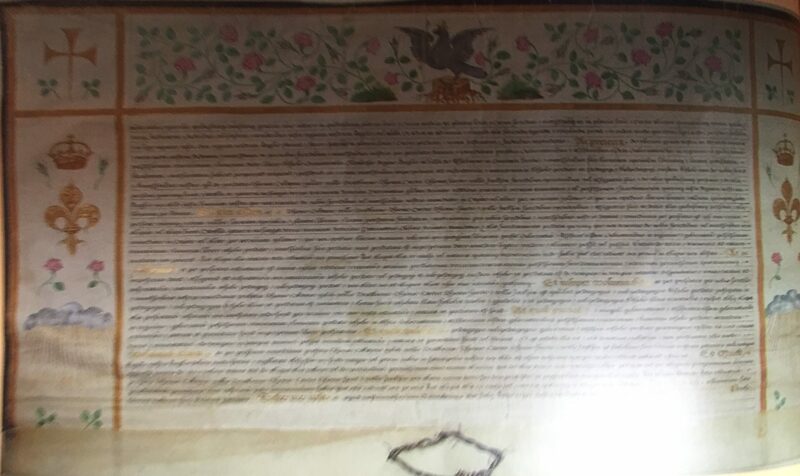 Meanwhile, the charter is on display for ONE MORE DAY at the Library in Ashbourne – this Monday 25 September – and then will be returning to storage at the Derby Record Office. So get over there! With my thanks to Sharron Lloyd-Johnson and the Ashbourne Old Trust. This document looks fantastic and I can’t believe that I although I only live 10 miles away, I didn’t know anything about it until now. I doubt I will be able to see it as I have to work on Monday. Hope it will be on display again soon. 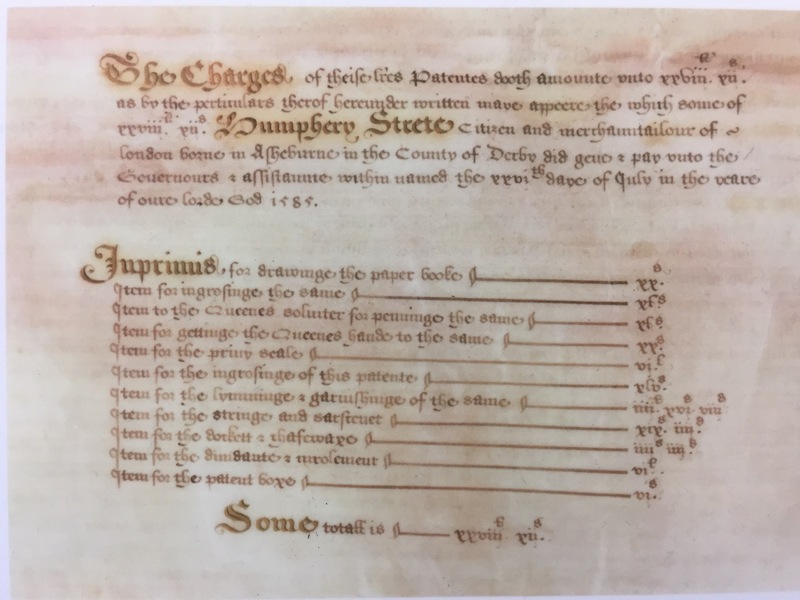 Have you seen the charter for Kingston Grammar School (founded 1561)? Interesting that Anne Boleyn’s execution cost £23/6/8 – I believe 6/8 was a “mark”, in which case the cost was exactly 70 marks. Dear Susannah, As a starting your best comparison will be with the Emmanuel College charter. 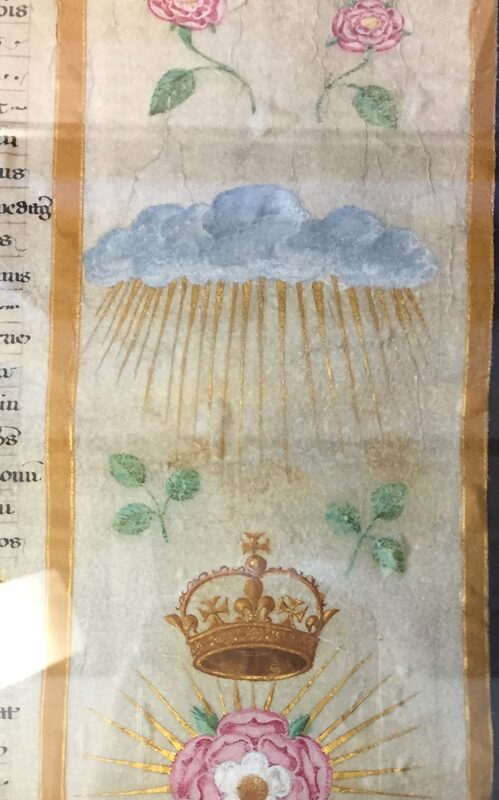 Mildmay commissioned Hilliard to illuminate this charter, just as the letters patent of Thomas Forster (embroiderer to the king) were illuminated by a member of the Horenbout family, but at Forster’s cost, not the king’s. The original patent is currently on loan to the V&A and was illuminated sometime between 1524 & 1528 when Forster died. 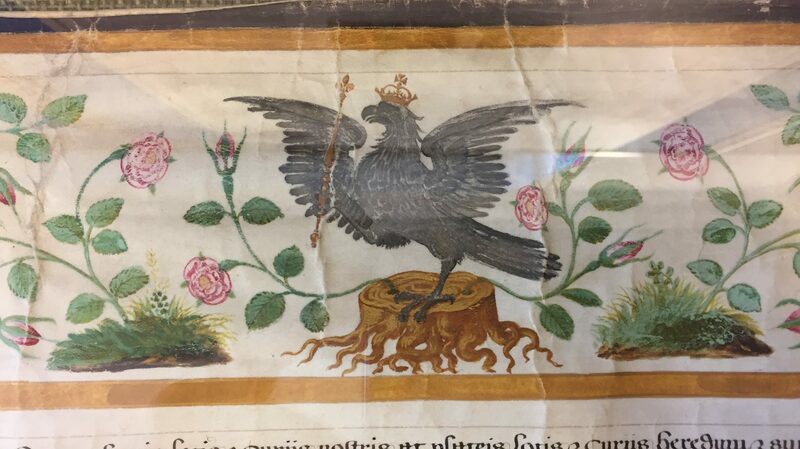 Anne Boleyn’s falcon motif at the bottom of the Ashbourne charter should of course, be coloured white. From what I see on screen, I would suggest that originally the illuminator used silver leaf, which would have glittered (especially in candlelight), but over the centuries it has oxidised which is why the falcon is now a rather dull grey/black. Hilliard is a particular favourite of mine. This is a lovely find. I hope the Derbyshire Records Office digitise it so it is more widely available. I often wonder if Elizabeth felt somewhat guilty for being born female. I’m sure s he knew that if she had been born male – her mother would have lived. This was her way of a subletally honoring her mother. She may very well have retained a scant memory of her mother. It’s rather appalling that Anne Boleyn’s execution was costed. wasn’t there a story that when she died she was wearing a ring which opened to reveal a portrait of Anne Boleyn? My ancestor, Ursula St.Barbe, married Sir Francis Walsingham & I still have some interesting Tudor items. My husband went to that school (Queen Elizabeth Grammar School) and his parents still have a house near Ashbourne. We were married at the registry office there, in fact. I’ve sent a link to this article to him to see if he has anything to add about this. Beautiful tribute to her mother! I have not seen this before now. I would be interested in any information you have re: the Charter for the founding of Dronfield Free School in 1578. Another Derbyshire school. This one founded by the Fanshawe Family; Henry and Thomas both Remembrancer of the Exchequer to Elizabeth the first. I am the Headteacher of what is now Dronfield Henry Fanshawe School and very proud to be the first female HT. Many thanks. Only wish you could return at some stage in the future as a guest speaker. Thank you so much, Allen. Thank you for the fascinating talk on Friday. 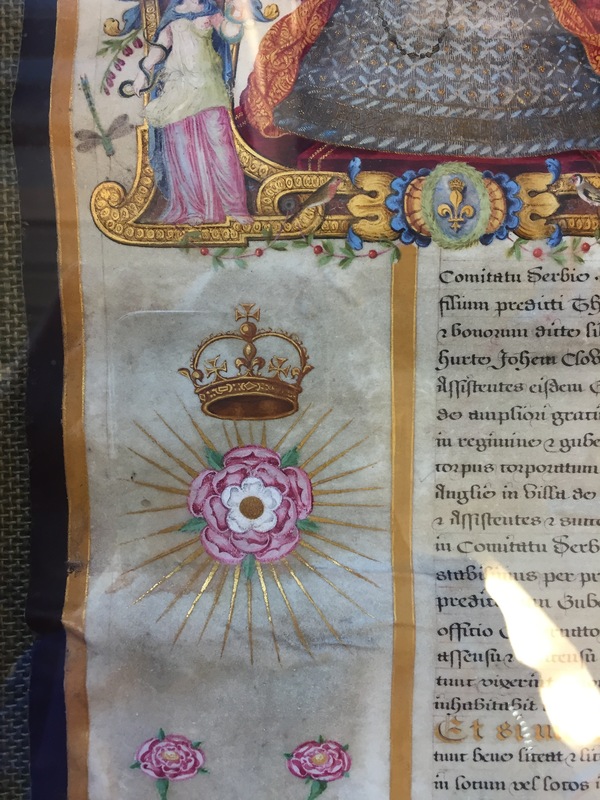 I edited the Ashbourne Treasures book and have a number of photographs of the charter (not taken through glass), which I would be happy to send you. None of them do justice to the original of course. I look forward to further developments! Congratulations to John for identifying Anne Boleyn’s badge in the first place. It’s a pity it wasn’t captioned in the book, but then none of us realised its appearance on the charter had any especial significance. Incidentally the similarity of Elizabeth’s portrait on our charter to that of Emmanuel College Cambridge of 1584 has caused some confusion. A search on Google Images for the Emmanuel one produces about five genuine reproductions but also one of ours masquerading as their’s and described as a genuine Nicholas Hildyard !! I only noticed it myself when I saw the Latin words ‘Comitatu Derbie’ (‘in the county of Derby’) at the foot. The offending website where it appears is that of an international American/French company – WahooArt.com’ – which sells reproductions of major art works framed or as posters etc for large sums. As they are very hot on their copyright perhaps the Old Trust should prosecute them for misrepresentation …. !! There is one small difference between the badge used by Anne Boleyn and that on the Ashbourne School charter. Anne’s badge had both red and white roses ‘growing’ out of the trunk (not Tudor roses). 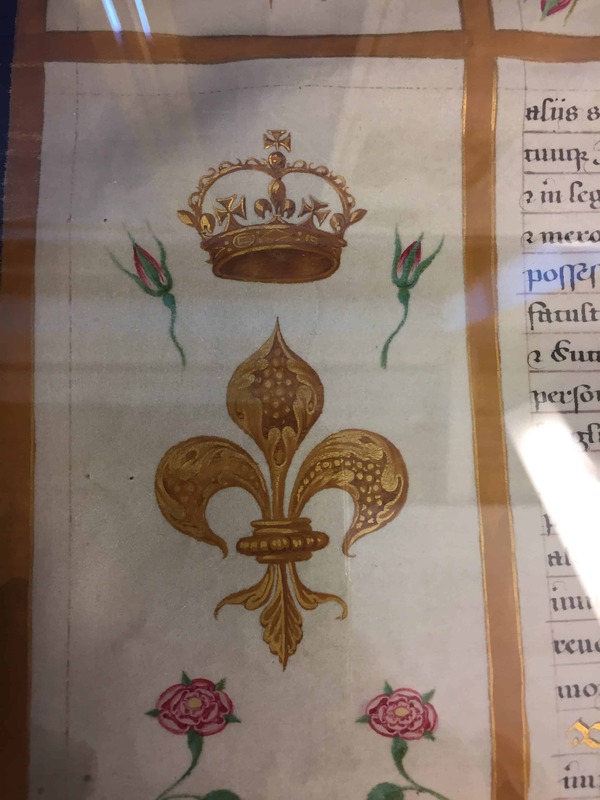 The roses on the charter badge are eglantines (sweet briar roses) which feature in the decoration of the borders running across the top of all three membranes of the charter. Although the napkin says “Quene Elizabeth” at the top, it shows not just Anne’s badge but also her complete arms as Queen of H VIII, i.e. not the arms of Elizabeth as monarch. It may also be of interest to note the following mark of Elizabeth’s attitude to her mother’s memory. As is well enough known, 4 alleged adulterers were executed at the same time as Anne. One of these was Henry Norreys/Norris, who went to his death protesting Anne’s innocence.. He was attainted. His eponymous son not only had all his father’s wealth restored to him by Elizabeth but was also given important appointments, knighted and finally, in 1572, given a peerage (by a ruler notoriously reluctant to confer honours). This second Henry Norreys married the daughter of one of Elizabeth’s former ‘gaolers’ (Lord Williams of Thame) and the two women were friends. I have always believed the favour shown this couple reflects not just Lord Norreys’s ability and loyalty but also that Elizabeth wanted to repay his father for defending Anne Boleyn’s reputation. However, much as the royal favour may have been welcome, it didn’t prevent 5 of the Norreyses’ 6 sons dying in Elizabeth’s wars.